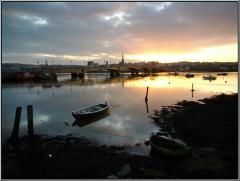 Wexford Harbour comprises of the large body of estuarine water located between Raven Point to the North and Rosslare Point to the South where the Slaney and smaller Sow Rivers enter the sea. The harbour is sheltered and shallow and contains several species of fish. There are a number of popular shore fishing grounds located at Ardcavan, Ferrybank, Katts Strand, Ferrycarrig and The New Marina. Wexford harbour is growing in popularity as a small boat angling venue. It`s geographical position means that it is sheltered to all winds except easterlies.